Even though L.A. has been experiencing insanely hot temperatures lately, I've been ready for fall clothing for quite some time now. 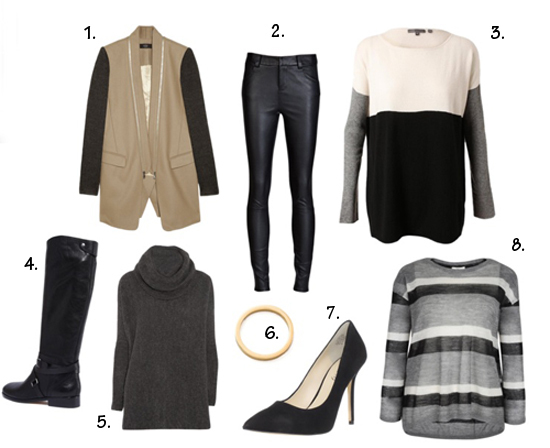 I tend to gravitate towards a lot of gray and black in the fall and winter months and the pieces below are just a few of the items I'd love to add to my wardrobe. I've actually tried on #'s 3, 5 and 8 and all are even more amazing in person (which makes me want them even more!). What are your fall favorites this year? I gravitate towards neutrals like gray and black too, but I am going to to add some hunter green and camel into the mix this year, as well as a few prints. The cowl neck sweater would have to be my favorite! Gray is absolutely my cold weather color....& thanks for sharing these chic gray pieces!! I'm with you! Here in San Diego we just cannot break this hot streak, and I'm totally ready for Fall fashion! I love that Vince Cowl sweater... looks so cozy, and all of these shoes are amazing! Adore that cowl sweater! It's gorgeous, would be so fun with boots and tights this winter. Love everything, Audrey! Great picks! My faves are the Tibi coat, J Brand leather pants, and the Joie sweater!! ahh, i love shades of grey and black for fall! these pieces are all kinds of perfect! Loving the Tibi jacket! Too fab! A pair of leather pants has been on my wish list for a while. Loving all of your selections! i've been eyeing that vince sweater too (#3)! although i love the warmer weather, i can't wait for fall! Gosh, I've been craving fall clothes too! There's so many great pieces right now. Love that contrast coat and leather pants. That wool coat is inSANEly gorgeous. I am SO ready for fall and fall fashion! Love your picks! i think i am finally ready for fall...this heat has really pushed me over the edge! lol! all great picks...i am totally lusting over all things tweed & leather right now!